A synthesis of over 100 studies showed that Nicotine replacement therapy for smoking cessation had been effective. Compared with a dummy treatment (placebo) treatment with nicotine replacement double your chances of quitting smoking! This is not in itself a miraculous solution, motivation and strategies to prevent relapse should accompany it, but this type of treatment helps in relieving disorders caused by nicotine withdrawal (withdrawal symptoms) also be acquainted with the nicotine withdrawal timeline . Nicotine replacement for smoking cessation products come in different forms. In this category you will find a description of the advantages and disadvantages of each of these products: patch, gum, lozenges or tablets dissolve and inhalers. Nicotine replacement therapy for smoking cessation alleviates withdrawal symptoms. They work by releasing nicotine in relatively small doses, coming slowly into the blood. The “shot” of nicotine received by the smoker is replaced by a gradual diffusion making weaning less painful. Nicotine, when inhaled with tobacco smoke, creates a physical dependence. When stopped, the lack of nicotine can cause unpleasant withdrawal symptoms: urgent need to smoke, irritability, depression, difficulty concentrating, anxiety, sleep disorders, headaches, weight gain, increased appetite. Nicotine replacement therapy offsets some of this lack of nicotine. They provide the nicotine your body received when you smoked. They reduce withdrawal symptoms and allow you to focus on other important aspects of the judgment, social, behavioral and psychological aspects of quitting cigarette smoking. Using nicotine replacement, you avoid inhaling tar, toxic substances, carbon monoxide and other toxic gases in contained in tobacco smoke. Nicotine replacement therapy is medication. Please read the package insert or consult a specialist. A tobacco specialist will advise you while taking into account other barriers to your stop, psychological and environmental barriers. 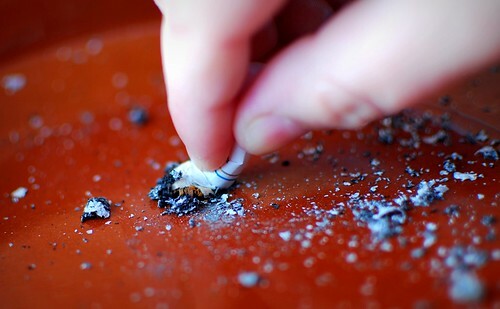 Logically, the more you smoke, the more you are dependent and the more withdrawal symptoms we suffer. It will then increase the dose of nicotine replacement therapy. The first thing to do is to calculate the dose at which it was used as a smoker. On average, a cigarette contains 1 to 2 mg of absorbed nicotine, for example, a smoker who used to smoke more than 20 cigarettes per day, will have to choose a patch 21 mg over 24 hours. The penny-dosing is common and can lead to relapse so the need to not sub-measure out these products and take them throughout the recommended duration (8-12 weeks). Many experts believe that the dosage of nicotine replacement therapy should be about 1 mg of nicotine per cigarette consumed. According to this principle, a person who smokes 25 cigarettes a day could take a patch to 24.9 mg or take 12x2mg microtabs. This principle of 1 mg of nicotine per cigarette however, must be qualified. First, it must be remembered that the gums and patches release only 70% to 75% of the nicotine they contain, unlike any microtabs which nicotine is ingested. Secondly, recent research shows that the number of cigarettes per day should be weighted by the intensity with which one “pulls” on the cigarette. As against the type of cigarettes, more or less strong, has no influence on the amount of nicotine absorbed: light cigarettes are capable of delivering as much nicotine as regular cigarettes! People who draw very hard on their cigarettes and fail to reduce their consumption will probably need a higher dose of nicotine replacement therapy. Generally very dependent smokers will benefit greatly from substitution treatment and monitoring by a specialist. Instead, people who smoke less than 5 cigarettes in a day, and who also smoke their first cigarette of the day more than an hour after waking up and do not feel withdrawal symptoms are probably not dependent. For these people, the Nicotine replacement therapy is less useful. If they still feel very dependent, it may be that addiction is less physical than psychological or behavioral. In such cases, a medical or psychological support is also provided. All people are not equal before the same dose of nicotine. Often hereditary physiological factors, in fact determine the proportion of nicotine that becomes available in the blood and the body’s sensitivity to nicotine. Overdose of nicotine replacement therapy is rare. But it happens, then it is better that you are able to recognize the signs: total disgust of tobacco, insomnia, unpleasant taste in the mouth, nausea, headache, dizziness, increased heart beat rate and diarrhea. In case of overdose, it is usually sufficient to remove the patch or gum or spit Microtab. The under-dosing is a much more common occurrence when compared to overdosing. It is then the withdrawal symptoms appear, and they is an increased risk of relapse. How can you differentiate the symptoms of overdose from those in dosage? Some symptoms are indeed identical (nervousness, insomnia), it is not always easy to know if it is because they take too much or not enough nicotine substitutes. In principle, if you still want to smoke, it is under-dosing. And if you are totally disgusted with tobacco, then it is an overdose. If you suffer from this kind of symptoms or if you have a doubt about the dosage, the best thing to do is to consult a doctor. Alternative treatments generally last three months and is stopped gradually. The dose can be reduced gradually. It is recommended to allow the body time to break the habit. These three months are given as an indication average. It is above all a matter of personal strategy, we must determine alone or with a therapist. At most, it is recommended that smokers who quit nicotine substitutes to keep some on hand for the first few weeks, in case of urgent need (anything is better than picking up a cigarette!). Treatments can be extended if necessary, when the imperious desire to smoke is still felt and premature interruption greatly reduces their effectiveness! In summary, for or against? It is an individual choice. Alternative treatments are not a panacea but they greatly increase the chances of stopping, especially for highly dependent people. The best option is that they are accompanied by other measures of treatment and they is follow-up by a specialist. It is also important to take care of the psychological and physical dependence. In addition, these treatments have few side effects and little risk of addiction. The slow diffusion of substitutes, in contrast to the rapid diffusion of cigarettes smoked (effect “shoot” in less than 7 seconds) protects against this risk. Indeed, the dependence depends especially on the speed of nicotine absorption.